The Gorkha Janmukti Morcha will launch the campaign for municipal polls in Darjeeling tomorrow, demanding the upgrade of the hill town's civic body to a corporation and training its gun at the Trinamul government for allegedly "killing all democratic institutions" in the hills. Even though the state has not yet announced the dates of the civic polls, the Morcha's decision to start its campaign suggests that the hill party is feeling the pressure from rivals like Trinamul, GNLF and the Jana Andolan Party. D.K. 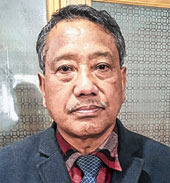 Pradhan, the president of the Morcha's Darjeeling subdivisional committee, today said: "We have formed seven groups for the election campaign in Darjeeling. We will start our campaign in wards 1, 2, 3, 4 and 19 tomorrow. We plan to cover all 32 wards by the month-end." Morcha president Bimal Gurung is camping in Kalimpong where the party is expected to face a stiffer opposition as and when elections are held. "In Darjeeling, we will demand that the municipality be upgraded to a corporation. In fact, the Left Front government had agreed to upgrade the municipality, which is the second oldest civic body in Bengal having been established in 1850. But the GNLF did not accept the proposal," said Pradhan. Pradhan was the GNLF Darjeeling MLA and the municipal chairman when the Left government thought of upgrading the civic body. He was keen on the corporation status but was removed from the chairman's post by the GNLF leader Subash Ghisingh. Many believe the decision was taken as Ghisingh was not interested in the corporation status for reasons which are not clear. In 2005, the GNLF-controlled Darjeeling municipality's board passed a resolution and sent it to the state government stating that it didn't want the corporation status. "The Left Front government has made some relaxation in the rules. For a town to become the corporation, the population of the area has to be above 5 lakh. But for Darjeeling, the government was planning to relax the rule and fix the population limit at 1 lakh, given the terrain of the hills. We want the government to upgrade the Darjeeling civic body," said Pradhan. The Morcha's move, observers, believe is expected to mount pressure on Mamata Banerjee as her party has formed districts, police commissionerates and new municipalities across the state over the past six years. "In the hills, the government is interested in killing all democratic institutions. Development boards have been formed through nomination of members. Municipal elections have been deferred and panchayat polls have not been held since 2000," said Pradhan. For panchayat elections to be held, the Centre has to amend the Constitution which has not yet taken place. The Morcha will fight the municipal polls on the emotive plank. "All efforts are being made to undermine our fight for self-determination. Efforts are on to break our community, divide the people and dilute the statehood demand. These issues will also be brought up during the campaign," said Pradhan. Each of the seven groups comprise elected GTA Sabha members, ex-municipal councillors and Morcha leaders.